To be regarded as the best Tennis Development Centre in Canada by providing exceptional service in the areas of tennis lessons, membership and public play. 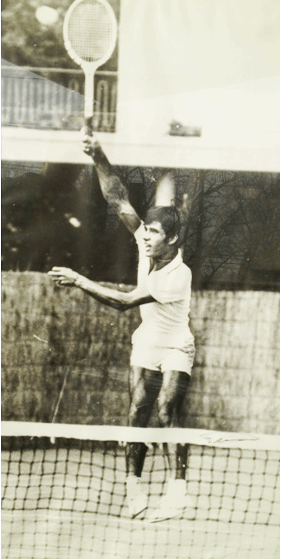 The Tennis Academy has been providing Calgarians a place to play tennis and take lessons since 1973 when it was opened by Rico Policarpo (pictured to the right.) Rico aspired to make tennis accessible to everyone in Calgary throughout the winter months, and his mission still lives on. He successfully accomplished this goal when he covered six outdoor public tennis courts with a bubble and attached an atco trailer to serve as a clubhouse. In the summer of 2000, The Tennis Academy expanded by building four new indoor courts, a large clubhouse to include men's and women's locker rooms, a well-equiped pro shop, and a fully serviced lounge. We are now the largest public INDOOR TENNIS CLUB in Western Canada. The Tennis Academy has a long history of supporting and developing competitive tennis in Alberta. The Tennis Academy has produced 9 different National Junior Champions as well as numerous juniors who have attained a National ranking of 6 or better. We host 16 tournaments per year for Tennis Alberta which is more than every other club in Alberta combined. The Tennis Academy has been a family owned business since 1973. All of our owners are either family or close personal friends. We endeavour to create a warm and friendly environment so that our members and public guests view the club as their home away from home. To help grow the popularity of tennis in Calgary by providing exceptional service in the areas of tennis lessons, membership and public play. One day we would like to see tennis enjoy the same amount of participation as other sports such as hockey and soccer.